In three days’ time, my father will have been dead for a year. I have a hard time believing that. Sometimes, it feels as if he’s been gone forever. Other times, I hang up the phone mid-dial, when I remember that he won’t be there to answer whatever question I wanted to ask him – usually about World War II. A while ago, I wrote here that I was going to publish all the letters Dad wrote home to my mom. I’ve since had the chance to read them, and truthfully (surprisingly), they don’t make great blog-fodder. Instead, I will publish just this one – which my mother has given to me to keep, as it seems to have just a little bit of everything in it. It’s very strange to read my father’s words while he was courting my mother (while my mother was courting somebody else – gasp…! ); he sure was a tease – I can just hear his voice when I read this. Anyhoo… I’ve kept the syntax the way he wrote it – some sentences may need to be read twice to get the proper gist – but I’ve taken the liberty of breaking things up into paragraphs. I guess paper was at a premium, and he didn’t want to waste it. He was training in England when he wrote this. 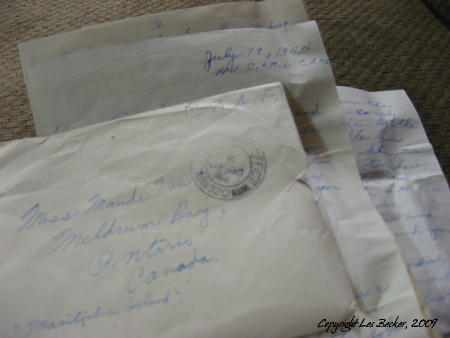 I received your letter and pictures to-night so here goes for a start at least. I don’t know when I’ll finish this. Say how do you manage those pictures anyway? That ‘close up’ of you alone looks like Dorothy Lamour. They were all very good and Thanks a million for sending them. Now I’ll have something to spend my spare moments at gazing. There was a buzz bomb went over a few minutes ago and of all the jobs I had to doing. By the time I realized what it was and got outside it had gone past. I thought it was a squadron of our own planes until it was right above us – one of the fellows here has had his camera ready for a couple of weeks intending to get a picture of one but they seem to be too fast. They make a terrific noise and fly very low and fast. It is only a few seconds from the time you first hear them until they are gone out of hearing and at night look like a ball of fire in the sky. This place seems to be charmed or something. There has been any number of them went over but none have taken a notion to stop here yet. The closest were a mile or so away and just shake the windows and doors. Well I wouldn’t mind if I could get a couple of weeks leave on the Island now. I can imagine the nice weather you would be having there. I am kind of disgusted with the weather over here. There doesn’t seem to be much difference in the winter and summer. We had a few weeks nice weather the last of March and since it has been raining about three parts of the time. The fogs are beginning to start now & also the blackouts again. I wouldn’t mind so much but through what nice weather there was we weren’t allowed any leave and by the time this course is over the fog will be so thick we’ll have to carry a shovel with us to make a way for us. Of course that shovel would be handy to have along for the B.S. too wouldn’t it? This is a sort of gloomy letter I guess it’s the army blues. I hear they are going to give the 7 day leaves soon (I hope. I have 16 days coming now). They have already lifted the ban on train travel & the 20 mile limit. Before we had to ride on the buses or hitchhike as the trains were supposed to be reserved for the evacuees. I guess all the small towns are filled with them now. Bill (Ahem…* Sorry to interrupt: Bill is my mother’s brother) thinks England is O’K. eh? To tell the truth I like it a lot better than Canada too as far as army life goes. I’d sooner be in Canada just for the sake of being in my own country though. The stuff isn’t rationed as much now as it was. We can get most of the things you can in Canada but only in small amounts and they use you more like a human than an animal. With the odd bomb around and France not far away you’d be surprised the difference it makes to the N.C.O.’s & officers. There are very few A.W.L’s here. Fellows that were always away in Canada never think of going loose here. For one thing there really isn’t anything to go on the loose for like Canada. No means of travel and no place to go or stay or eat if you did go. Say I hope you don’t get tired of reading this monotonous thing supposed to be a letter and throw it away before you finish. I had a letter from Edith, my sister-in-law last week. You should see some of the queer English expressions but I’m getting used to them. I suppose if I’m over here another year I’ll be completely “Limetized”. There is a Limey camp right near us and we see quite a few of them often. Did you know Jack MacMillan from Cockburn Island? I met him in the canteen last week. He is here on an A.F.V. course. I had quite a chat with him. It almost seemed like going home. Well I haven’t been out of camp for a month now. I think I’ll go on a “bender” at the wet canteen and then settle down for the duration of the course and get ready for trade test Bay. It is only 4 weeks away now. It’s nearly three months since I came here and it only seems about three weeks. By the way don’t let Eiro tickle you too much (I HOPE). It makes me nervous and I’d hate to have to tell the instructor some day what is wrong with me. ha. ha. Let me know how your pictures of you and Helen and you and Helen and you and you and Helen, turned out eh? If I were you I would move my shorts around and get all sunburned the same. That would feel too much like shaving only one side of your face (Of course I’m not you though). How are you and the cows getting along in the mornings? Well I guess I’ll close as there isn’t anything else I can think of. In fact there was nothing to write about in the first place: Write soon & long. I’m getting so I can almost start an argument with myself eh? A Doctor in Sequatchie Valley in Tennessee was called to examine the young wife of an elderly, deaf mountaineer. “Your wife is pregnant” he told her husband. Mountaineer, hand behind his ear, queried, “eh”? Excuse the writing. It is slightly worse than usual as there is a poker game going on, on the next bunk & every once in awhile somebody just has to step back & shake my bunk. I would dearly love to know what “job” it was that my dad was doing when that buzz bomb went over. I don’t know if he started writing the next sentence without realizing he hadn’t finished the last, or if it was something a little embarrassing and he didn’t want to say. Perhaps, he was in the latrine…? My mother still remembers writing to him about that sunburn she got, from laying for too long in one position. And how her father used to give the girls holy hell for going out in public wearing shorts. He thought it was shameful. And I guess one might have to be a man to figure out how shaving one side of your face might feel the same… does shaving hurt like sunburn?! I wanna know. Thank you for sharing that Les. It was lovely. Les Says: Well, you’re welcome, Denise. Thanks for reading! Les Says: You’re welcome, Jayne. Thanks, as always, for coming by. This is great. I have some of the “courting” correspondence from my parents, but this is priceless. So long and detailed. I like how newsy it is. Time after death both drags and flies. It never is what you expect. Les Says: You’re right about that. I’m glad the family chose to “celebrate his life” though, and what tears there were, well, they were mixed with laughter. I think we might have fast-tracked the grief a little bit that way. He’s still very, very close. I’m comforted by that. every body miss their parents, sorry to hear that.